This Compass Box Blended Malt Scotch whisky is mellow with subtle fruity aromas of vanilla and clover. 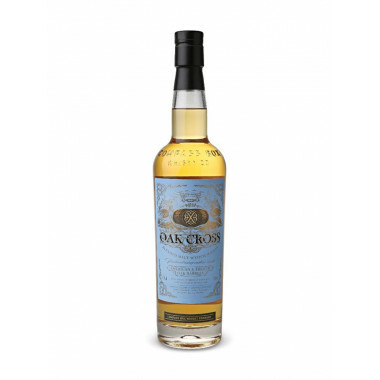 Oak Cross bears its name boldly as it embodies the best ageing characteristics of American and French oak casks. This Blended Malt Scotch whisky is mellow with subtle fruity aromas of vanilla (from the American oak) and clover (from the French oak). "A malt combination of exceptional quality", according to Whisky Bible. “Anyone can bottle a Single Cask; the real skill in Scotch whisky is demonstrated by the blender.” This quote from John Glaser, founder of the Compass Box Company, sums up perfectly the current context. In the last few years, the trend has been focusing on Single casks. Running against the stream, John Glaser’s approach may be seen as a bet, or madness. But some would say this is well thought, prepared and resulting from a long experience. Before discovering the whisky world in 1994, John Glaser first worked for the wine industry. Six years in the Diageo group, global leader in spirits, developed a passion for whisky and a new conception of blending. In 2000, John Glaser took off to give it a go. The first blend he made was in the kitchen. Later, he settled in the basement of a hair salon at the heart of London. He moved his small laboratory in a spacious loft, in Chiswick Studios, still in downtown London. A world apart from modern processes, John Glaser created a whirlwind in the traditional methods of blending with his craft approach, not aimed at creating a product meeting marketing criteria. The only parameter taken into account by John Glaser is pleasure, and maybe his own above all. Everything is done by the nose; no electronics enters the elaboration process. However, nothing is left to chance. To create richness and balance is the only aim of John Glaser. To reach that goal, he selects only the best Single Malts and Single Grains, but goes way further than a commercial agent, as he blends and creates new whiskies and new emotions. Each whisky proportions are blended according to the required style and prevailing aromas.